For months, if not years, House Appropriations Committee Chairman Harold "Hal" Rogers of Eastern Kentucky has talked about the need for better Internet service to boost the economy in his 5th District, which is not only the nation's poorest but has lost 6,000 jobs in coal, its only big industry, in the last two years. In writing the federal budget that Congress passed this week, Rogers did something about that, though exactly how he did it remains unclear. Bill Estep of the Lexington Herald-Leader reports, "As part of a $12 million budget increase for the Appalachian Regional Commission, Congress directed $10 million to broadband development in distressed counties affected by reductions in coal jobs, according to Earl F. Gohl, federal co-chair of the agency." There is no such reference in the bill's language for the ARC's $80.3 million budget, and Gohl's chief of staff, Guy Land, didn't reply to an email Saturday seeking comment. Appropriations Committee spokeswoman Jennifer Hing said in an email that the money "is part of the ARC" budget. "The budget language does not specify Eastern Kentucky," Estep writes, "but it appears the region will be first in line for the money. Eastern Kentucky is home to the highest concentration of distressed counties in the multi-state ARC, and has lost a greater percentage of its coal jobs than any region of the country the last two years." Tobacco use is linked to diseases that might surprise you; smoking rates remain high in rural U.S.
"The other health problems the report names are vision loss, tuberculosis, rheumatoid arthritis, impaired immune function and cleft palates in children of women who smoke," Tavernise notes. "Smoking has been known to be associated with these illnesses, but the report was the first time the federal government concluded that smoking causes them. The report is not legally binding, but is broadly held as a standard for scientific evidence among researchers and policy makers." To read the full report, click here. The rate of U.S. smokers among adults 18 and older dropped from 24.7 percent in 1997 to 18 percent in 2012, according to the National Health Interview Survey by the federal Centers for Disease Control and Prevention. The CDC lists the median percent of adult smokers in the U.S. in a 2012 report at 21.2 percent. But numbers are much higher in states with large rural populations, led by Kentucky at 29 percent and West Virginia at 28.6 percent. Other states with high numbers are: Arkansas, 27 percent; Oklahoma, 26.1 percent; Mississippi, 26 percent; Louisiana, 25.7 percent; Indiana, 25.6 percent; Ohio, 25.1 percent; Missouri, 25 percent; and Alabama, 24.3 percent. For an interactive map click here. Public split over huge metal mine proposed in Minn. The PolyMet Mining Corp. project, which "would produce nickel, gold, platinum, palladium and other valuable minerals ... would create about 300 jobs for about 20 years with the possibility of another 60 jobs if a secondary processing plant is built in the future," Myers writes. "Critics say the threat of acidic mine runoff, along with sulfate and heavy metal water pollution, is too great. They say the project could require water treatment for centuries after the mine is played out, spoiling local waters and leaving taxpayers to pay for the cleanup." At issue was a "Department of Natural Resources forecast — a dense, 2,200-page environmental impact statement released in December that took five years and cost PolyMet about $22 million — of the project’s effect on northeastern Minnesota," Josephine Marcotty reports for the Minneapolis Star-Tribune. "That analysis, together with public comments, will lay the foundation for decisions by the DNR next year on whether to grant PolyMet the permits that would allow the project to proceed." Is it illegal to wear Google Glass while driving? That remains up in the air. But score one for the technological crowd, after a charge against a California driver for wearing the device while driving was thrown out Thursday, because there wasn't enough evidence to prove it was turned on while she was driving, Heather Kelly reports for CNN. Cecelia Abadie, a Google Glass tester, said the device was off, but was still issued a ticket for using it. "Google Glass wearers in California can still be pulled over and cited for wearing the head-mounted displays while driving," Kelly writes. "Whether they get a warning or a ticket will be up to the individual officer. Getting a charges dismissed will then be up to individual traffic court judges." Despite the win, Abadie's attorney told Kelly, "It doesn't necessarily answer the question everybody wanted: Is it legal to drive down the road wearing Google Glass while it's operating?" Parts of Louisiana, Kentucky, Tennessee and West Virginia are being added to the U.S. Department of Agriculture's "StrikeForce" program aimed at increasing economic opportunity in rural areas with persistent poverty, bringing the total to parts of 16 states. It gives extra weight to applications for federal assistance from the areas. "There are 703 counties that have been persistently poor counties, with high poverty rates for extended periods of time. Of those, 537 are located in rural America," Agriculture Secretary Tom Vilsack told the Lexington Herald-Leader. "It is fairly obvious to me that there is a significant rural component to the poverty America is dealing with." Vilsack wrote about it on the Huffington Post Politics blog, saying, "Rural America faces a unique set of challenges when it comes to combating poverty in our towns and communities. Too often, rural people and places are hard to reach or otherwise underserved -- but not forgotten." In Kentucky, 73 of the state's 120 counties will be included, approximately one-third in the depressed Central Appalachian coalfield. "The effort will work in tandem with the federal 'Promise Zones' designation announced last week by President Barack Obama for eight southeastern Kentucky counties" and four other poverty-stricken areas, Janet Patton reports for the newspaper. It will also complement Shaping Our Appalachian Region, the initiative of Democratic Gov. 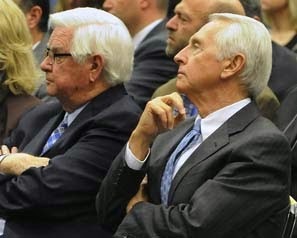 Steve Beshear and 5th District U.S. Rep. Harold "Hal" Rogers, R-Somerset, which is "aimed at diversifying and revitalizing Eastern Kentucky's battered economy," Patton reports. Areas with a community newspaper typically have fewer drug-related arrests, according to a study published in the winter issue of Journalism & Mass Communication Quarterly. "Community newspapers function to foster a perception of close-knit cohesive communities," and the greater their penetration into a market, the more civic engagement a community has, the researchers write. Civic engagement leads to a sense of belonging, which results in fewer drug-related arrests, they found. "Community newspapers promote civic engagement by highlighting the characters and activities of local residents and institutions, fostering affective attachment to community, presenting information that helps participate in community events and activities, and cultivating common values in pursuit of social goods," the researchers write. "Communities with such information resources tend to develop voluntary participation." The study examined a nationally representative sample of 389 counties in 24 states, chosen at random to represent the nation's four main regions. It used information from the federal Uniform Crime Reporting Program. The authors are Masahiro Yamamoto of the University of Wisconsin-La Crosse and Weina Ran of Washington State University. To read their full report, click here. A subscription may be required. Agriculture Secretary Tom Vilsack said Thursday that he believes Congress will pass a Farm Bill by the end of the month. "I'm confident we're now at a point that we've raised the expectation level so high that there's no going back. 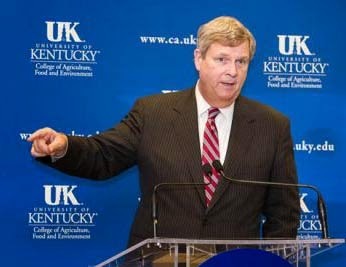 They've got to get some answers," Vilsack said in an interview with The Rural Blog after speaking at the University of Kentucky College of Agriculture, Food and Environment. The biggest sticking points are the dairy provisions in both the House and Senate versions of the bill, which House Speaker John Boehner has called "Soviet style." House Agriculture Committee Chairman Frank Lucas has said he is crafting compromise language. UPDATE: For possible provisions, from David Rogers of Politico, click here. Asked if he thinks Lucas will come up with language that will satisfy Boehner, Vilsack answered crisply, "Yes." He added that the issues are difficult, but indicated that Department of Agriculture staffers are working with Lucas to draft the language. "I'm just confident in the whole process," he said. As Vilsack visited Kentucky, the Senate cleared a procedural path for considering the conference committee version of the bill as early as Monday. Another reason the Farm Bill will pass, Vilsack said, is that it must pass, for many reasons. He said that without a new bill, cotton farmers will face trouble from Brazil on the trade-protection, and he will be forced to follow permanent law on dairy price supports, creating a "milk mess," a term this interviewer used first in the conversation. Volunteer fire departments that feared federal health reform could significantly harm their ability to provide services in rural communities need no longer worry. After hearing complaints from officials in towns that said they couldn't afford insurance coverage for volunteer firefighters and emergency responders working 30 hours a week, and lacked the body count to increase the staff to accommodate lost hours, the Treasury Department announced that volunteer fire departments and emergency responders won't be counted as full-time employees, and their departments will be exempt from providing coverage, Alanna Durkin reports for The Associated Press. UPDATE, Feb. 11: The Treasury Department has issued the regulations. Eastern Kentucky, southwest Virginia and southern West Virginia have been hit hard in with the loss of coal jobs, high rates of unemployment and poverty, and a economy that has continued to struggle despite numerous attempts to find means of improvement. Officials in all three states hope to boost the economy by offering visitors a glimpse into the history and culture of the region during a a two-day journey on a train trip through the three states, Russ Cassady reports for the Appalachian News-Express in Pikeville, Ky. The trip, which is scheduled to leave from Grundy, Va., on April 12 and reach in Devon, W.Va., on April 13, is part of the Tennessee Valley Railroad's 21st Century Steam Program spring excursion schedule. Nine trips are scheduled, beginning March 29 with a day trip from Chattanooga, Tenn., to Attalla, Ala., and ending June 7 with a trip from Chattanooga to Stearns, Ky. The Grundy-to-Devon itinerary will have two trips each day, allowing a total of 2,000 people to ride, Cassady writes. Charles Carlton, director of energy and community development in Pike County, Kentucky, "said there are several points of interest for potential visitors — including the connection to the Hatfield and McCoy feud, an opportunity to see coal mining and also the historic nature of the passenger rail trip, which at one time was common in the area," Cassady writes. "Riders will also get to see another angle of Clintwood Elkhorn’s preparation plant, giving an insight into the coal mining industry" and they "will get to pass through two tunnels, and will also cross the Tug and Levisa Fork of the Big Sandy River as it travels through the three states." Pike County Judge-Executive Wayne T. Rutherford "said the possible benefits to the area are tremendous and that each community that is connected to the trip has a chance to capitalize," Cassady writes. "Hotels in all three counties, officials said, are working to provide packages to visitors who come in for the rail excursion." In October 2011 residents in the region voted to ban large-scale resource extraction that included mining for gold and copper. State officials sued to invalidate the vote. EPA continued to study the area, extending the public comment period to June 30, 2013, with some arguing the mine was the only decent source of income in the area. Overall, there was 1.1 million public comments on the issue, Demer writes. Dennis McLerran, administrator for EPA's Seattle-based Region 10, told Demer, "There are clear losses of habitat from the mine footprint and from the mining activities themselves. The lost habitat means 'significant risks to fish and wildlife and the cultures that are there'." Northern Dynasty Minerals, the developer, "says the region's mineral deposit is among the largest and richest in the world, with the potential to produce more than 80 billion pounds of copper and 107 million ounces of gold over three decades." The Common Core State Standards, an education initiative adopted on a state-by-state basis, were designed to guide what students learn in each year of school across the nation. The standards focus on English and math and require students to master less information more thoroughly. From its inception, the movement had both enthusiastic proponents and wary opposers, and the debate continues today, some attributing never-before-seen academic success to the standards even as a leading conservative voice decries them as way to more government control. Kentucky was the first state to adopt the standards several years ago. Todd County, a very rural county on the Tennessee border, has seen major improvements in student success and positive transitions in spite of the government's cutting funding. School officials and teachers knew it would be difficult, but knew "at some point the stricter standards would pay off for Todd County, a county that has seen youth poverty on a rampant rise and budget woes for nearly a decade as the local economy has struggled," Editor-Publisher Ryan Craig writes for the weekly Todd County Standard. Most notably, Todd County High School, which had previously struggled, was in the top 9 percent of all schools in the latest statewide tests. Craig suggests that the standards were a key factor in the success, in spite of the apparently increased difficulty of the Common Core tests. The teachers in the county worked hard to learn the new material and planned ways to help the students catch up, he reports. Now elementary school students cannot as easily make the Principal's List as a result of higher criteria, and in the high school, students are taking more college level courses. However, state budget cuts are making it difficult to move forward. "If we continue to receive cuts, we will have to look at raising additional local taxes to continue to have current programs and teaching staff," Makka Wheeler, the schools' finance officer, told the Standard. "We need stability of state and federal revenues; however, we have had seven years of cuts." That was the point of Craig's front-page column, which was headlined, "We can't let funding stop education momentum." On the other side of the debate are those who says the standards kill creativity, ignore the differing educational needs of students and promote more governmental control. Conservative columnist George Will writes for The Washington Post Writers Group that the debate will continue to heat up as people realize the true nature of the standards. While the Department of Education promotes the standards, the 1979 law creating it "forbids it from exercising 'any direction, supervision or control over the curriculum' or 'program of instruction' of any school system," Will notes. He says that is only the beginning of the pressure that will increase for schools to regulate content, and "Washington is already encouraging the alignment of the GED, SAT and ACT with the Common Core." The government has bought states' agreement with the standards with the promise of federal funding. Although 45 states and the District of Columbia originally accepted the deal, some are reevaluating the decision, and more will do so. The fact is that "Fifty years of increasing Washington inputs in K-12 education has coincided with disappointing cognitive outputs from schools. Is it imprudent to apply to K-12 education the federal touch that has given us HealthCare.gov?" Will writes. This negative response to the Common Core highlights three healthy aspects of politics today, Will writes: Communication skills and technologies have mobilized information about the debate, communities' uprising against state capitals and Washington shows an unwillingness to conform to the "public agenda" if it's deemed unhelpful and political dishonesty is and will result in the appropriate consequences. These two opposing points of view on an important topic may indicate an aspect of the Common Core State Standards debate that is true of many other controversies: the Common Core is neither without flaw nor without advantages. What works for one school or district may not work for another. U.S. Rep. Hal Rogers, R-Ky. The $1 trillion budget plan introduced to Congress on Monday by Rep. Hal Rogers (R-Ky.) and Sen. Barbara Mikulski (D-Md.) has policy riders that are pro-coal, Washington correspondent James R. Carroll reports for the The Courier-Journal. Rogers and Mikulski chair the appropriations committees; he represents the nation's poorest congressional district, which has seen its coal industry more than decimated by geologic, economic and regulatory factors in the last two years. Her state has a small amount of coal, some of which has been strip mined. The bill, which the White House has endorsed, includes a provision that bars "any funding for the Army Corps of Engineers that would be used to change how 'fill material' from mountaintop mining and other operations is defined," Carroll reports. Coal interests fear a redefinition by the Corps and the Environmental Protection Agency that would complicate mountaintop mining, which relies on valley fills to dispose of much of the excavated material. UPDATE, Jan. 17: Francis X. Clines of The New York Times editorial page gives details in a blog post titled "Congress Moves Mountains." The bill would also "prohibit the Export-Import Bank and the Overseas Private Investment Corp. from cutting funding for coal-fired power plants overseas. The Ex-Im Bank last month adopted regulations requiring new coal plants to capture carbon emissions." The bill would also "provide at least $3 million for business development, job training and technical assistance in economically distressed communities dependent on the coal industry." Federal health reform was designed to make coverage affordable for all, but for many low-income people struggling from paycheck to paycheck, the Affordable Care Act is anything but affordable and is burdening people with one more bill they can't afford, Michael Ollove reports for Stateline. Sireesha Manne, a staff attorney at the New Mexico Center on Law and Poverty, told Ollove, "For those with very low wages trying to raise kids, after paying for housing, electricity, food, transportation and child care, asking people to pay another $50 or $100 a month, that’s just out of reach." The authors of the act anticipated this, so "The law allows states to create a separate insurance program, called the Basic Health Program, for people who earn too much to qualify for Medicaid and too little to afford insurance on the state exchanges, even with federal aid," Ollove writes. "Under such a plan, the federal government will give the subsidies directly to the states, instead of to individuals and families. The states are supposed to pool the money and then use the financial leverage to push insurers to offer less expensive coverage. A number of states are eager to create such programs, but they can’t until the Obama administration issues the regulations that will govern them." There's fear the states won't be able to launch the programs until 2016, which means that people not eligible for Medicaid will have to survive on the financial assistance available under the current plans, Ollove writes. Those plans are based on family income and the federal poverty level. "According to the ACA, a family of three whose annual income is at 133 percent of the federal poverty level (an annual income of $24,352), should have to pay no more than 3 percent of their household income in annual premiums, or $731. In that case, the federal government would pay the insurance company the difference between $731 and the actual premium. The percentage an individual or family is expected to pay rises at higher income levels, up to 400 percent of poverty. At that income level, paying up to 9.5 percent of household income on health insurance is considered affordable. So, a family of three making $73,240 would receive a subsidy to cover premium amounts above $6,958." "We have intelligence coming out of the Wisconsin state prison system that some of your rural communities are really open markets,"Capt. Tom Tuma of the Shawano County Sheriff’s Department in Wisconsin told Phelps. "Part of that is the perception we don’t have the law enforcement resources that some of the larger jurisdictions do . . . and that’s why you’re seeing these partnerships form between agencies. We’re trying to send a clear message that ‘We’re on to you,’ we’re going to work it aggressively and we’re going to try to deter them from further exploiting the rural areas of central Wisconsin." The results have been a sharp increase in arrests, Phelps writes. Officials working together in Wisconsin's Marinette County, population 41,000, and Michigan's Menominee County, population 23,000, made 76 drug-related arrests in 2013, up from 50 in 2012. Last year, 39 of those were for heroin, use of which is rising in many places. In Wisconsin, heroin-related arrests rose from 267 in 2008 to 672 in 2012, an increase of 152 percent, and 408 arrests were made in the first six months of 2013, according to information from the state Department of Justice. House Republicans presented a proposal Tuesday to help save the farm bill by using it "as a lifeline for Western towns and counties surrounded by vast stretches of tax-exempt federal lands," David Rogers reports for Politico. "The Interior Department now distributes about $400 million annually to 1,900 such local governments under a program known as PILT, or payments in lieu of taxes. But PILT’s funding authorization has expired with no clear replacement ahead." All counties with federal land get PILT, but the amounts are much greater in the West, where most federal land lies. Prospects for passage of the bill this month have dimmed because of an impasse over dairy programs between most lawmakers and House Speaker John Boehner. Both the House and Senate bills have "a new margin insurance initiative for dairy farmers which would include supply management tools to guard against over production," Rogers noted in a story last week. Rep. Collin Peterson (D-Minn.) "has argued that the supply controls are vital to keep down the cost of the insurance program," but Boehner "believes the increased government role amounts to a bridge-too-far in a world of dairy policy which the speaker is already fond of comparing to the former Soviet Union." There are other obstacles to passing the Farm Bill. Iowa Republican Sen. Chuck Grassley's "language to tighten the definition of 'actively engaged' for the purposes of farm-program payments was used as 'one of the selling points in the Senate,' and now "they are having a tough time backing off of it'," in the face of objections from mainly Southern farm interests, reports Agri-Pulse, a Washington newsletter. Agri-Pulse is subscription only, but a free trial is available by clicking here. Given these and other issues, the "Washington Insider" column of DTN/The Progressive Farmer said "It is becoming ever more likely that another extension of the 2008 farm law will become necessary" by the end of the month, Keith Good reports for Farm Policy. Peter Guttman photo: Eureka Springs, Ark. UPDATE, Feb. 20: The FCC says it will rewrite the rules, but Brian Fung of The Washington Post notes that teh agency has "a trump card" to hang over the heads of Internet providers: reclassifying them "as regulated utilities under Title II of the Communications Act. Doing so would entitle the FCC to reinstate all the old rules about traffic blocking and discrimination that were just eliminated by the court." The nation's most pivotal appeals court has struck down the Obama administration's efforts to enforce "net neutrality," the principle that Internet service providers should not discriminate among types of data they carry. Today's 2-1 decision by the U.S. Court of Appeals for the District of Columbia "holds tremendous portent for the future of the Internet," writes Brad Chacos of PCWorld. "Net-neutrality advocates fear that without rules in place, big companies like Netflix, Disney, and ESPN could gain advantage over competitors by paying ISPs to provide preferential treatment to their company's data. For example, YouTube might pay extra so that its videos load faster than Hulu's on the ISP's network." However, the court left in place the part of the Federal Communications Commission order that requires ISPs to tell their customers if they discriminate. An appeal seems likely, perhaps in a petition for rehearing by the full court, which has recently gotten new judges appointed by President Obama under the Senate's new rule barring filibusters against presidential appointments except those to the Supreme Court. The FCC could also try to rewrite the rules to pass muster with the courts, Scott Moritz and Cliff Edwards of Bloomberg News report. UPDATE, Jan. 19: The decision has ominous implications for journalism and news-media freedom, John Stearns of Free Press, which supports net neutrality, writes on PBS Media Shift. The rate of teen births dropped an average of 2.5 percent per year from 1991 to 2008, but from 2009, when the show premiered, to 2012, teen pregnancy has dropped 7.5 percent per year, according to the study. But it remains high. In 2012, more than 29 out of every 1,000 girls in the U.S. between the ages of 15 to 19 got pregnant, a rate higher than in any other developed country. In 2010, the rate was 33 per 1,000 girls, and in rural areas, 43 per 1,000, according to the National Campaign to Prevent Teen and Unwanted Pregnancy. Part of the study focused on social-media trends "to see whether locations with higher search activity and tweets about '16 and Pregnant' showed higher levels of searches and tweets about birth control and abortion," Jacque Wilson reports for CNN. "They did. The researchers also looked to see whether high viewership in certain areas corresponded with a bigger drop in teen births. It did." Melissa Kearney, one of the study authors, told Wilson, "Shows that make it clear how hard it can be . . . affect girls who might not care otherwise. You see she's fighting with her boyfriend on a daily basis. She's gaining weight. Her friends are partying without her." That's why the researchers credit the show for helping lower the teen pregnancy rate, because it highlights "the difficulties of raising a child at such a young age and have concluded from this coincident timing that the show is at least partially responsible for the recent decrease in teen childbearing rates," according to the study. "Our estimates imply that these shows led to a 5.7 percent reduction in teen births that would have been conceived between June 2009, when the show began, and the end of 2010. This can explain around one-third of the total decline in teen births over that period," the researchers write. "Data limitations preclude us from conducting separate analyses of pregnancies and abortions, but we note that teen abortion rates also fell over this period. This suggests that the show's impact is attributable to a reduction in pregnancy rather than greater use of abortion." To read the study click here. Economists ask: Instead of rules to slash antibiotic use in livestock, how about a tax or user fee? Estimated annual use, by weight, of antibiotics in U.S. Researchers "argue that a simple user fee on antibiotics makes more sense," Plumer writes. The study report says: "Every use of antibiotics increases selective pressure, thus undermining the value for other users. In effect, each antibiotic can have only a limited amount of use, so it is appropriate to charge a fee, just as logging companies pay 'stumpage' fees and oil companies pay royalties (A perfect fee would be calibrated to the extent of antibiotic resistance caused by each use; a practical fee, which is what we propose, would be based on the volume of antibiotics used.)" The authors say a user fee "would be relatively easy to administer, since it could be imposed at the manufacturing or importing stage," and "would deter low-value uses of antibiotics." They say it also "would generate revenues that could help to pay for rewards to companies that successfully develop new antibiotics, or to subsidize antibiotic-research investments, or to support antimicrobial stewardship and education programs." They argue, "The benefits to human health would be substantial. By reducing the volume of antibiotics, a user fee would mitigate the pressure of selection and diminish the prevalence of resistant pathogens. In addition, it could support the introduction of new drugs. According to our calculations above, a 1 percent reduction in the usefulness of existing antibiotics could impose costs of $600 billion to $3 trillion in lost human health. It is vital to protect this essential resource." They also suggest that "an even better approach would be an international treaty to recognize the fragility of our common antibiotic resources and to impose user fees to be collected by national governments," according to the study. "A treaty would level the playing field for agricultural producers while mitigating the disastrous overuse of antibiotics. Such a treaty would also have a chance of attaining international compliance, since governments would be motivated to collect the revenues. By contrast, a ban, which disadvantages local producers while providing no revenues to government, would be much less attractive to enforce." To read the study, click here. "Maybe we need to look for ways to get the processors out of that mix and figure out some other way to send that signal," Vilsack said, noting that USDA's Commodity Credit Corp. can buy other commodities' surpluses to stabilize markets. "He added that the conflict over dairy provisions shouldn't overshadow all the other good aspects of the Farm Bill," Clayton reports. Bourbon has a long tradition in rural America, with some of the most well known brands coming out of small towns in Kentucky. But the next time you grab a bottle of your favorite bourbon off the store shelf, you could be putting money into the pockets of a Japanese company. On Monday, Suntory of Japan announced a $13.6 billion deal to buy Beam Inc., which produces several brands of liquor, including Jim Beam and Maker's Mark, Bruce Schreiner reports for The Associated Press. Officials say the only change in the product will be the name of the owner, Schreiner writes. Chuck Cowdery, an American whiskey writer, told Schreiner, "Ultimately, what the consumer should be interested in is the product. There's absolutely no reason that the product should change. So the consumer really doesn't have anything to be concerned about." Senate Minority Leader Mitch McConnell (R-Ky.) introduced legislation Tuesday that "would give rural counties in Kentucky a voice when the Consumer Financial Protection Bureau, or CFPB, has incorrectly labeled them as 'non-rural'," McConnell said in a speech. The CFPB announced in May it was delaying for at least two years its redefinition of "rural counties" to "study whether the definitions of 'rural' or 'under-served' should be adjusted and to work with small creditors to transition to other types of products, such as adjustable-rate mortgages,” Stephen Koff reported for the The Plain Dealer in Cleveland. Federal health reform is a national policy, but it has a major impact on people at the local level, especially in rural areas. So, how can rural newsrooms with limited resources provide their readers with fair and balanced information? Deron Lee examines the question in a story for Columbia Journalism Review. "As implementation of the Affordable Care Act moves along, the law has far-reaching and sometimes unique implications for rural communities—yet few rural newsrooms seem ready or able to cover the story in all its complexity," Lee writes. Lee notes that Al Cross, director of the Institute for Rural Journalism and Community Issues, which publishes The Rural Blog, and University of Kentucky student Justin Richter "recently conducted a content analysis of ACA coverage in Appalachian Kentucky, 'one of the unhealthiest and poorest regions of the country.' They found that newspapers there 'gave their readers limited information' about the law in the two months leading up to the launch of the online insurance exchanges on Oct. 1, and coverage 'was dominated by opinions of public officials, largely those opposed to the law,'” Lee writes. Cross told Lee, “Opinion almost outran news ... and almost one-fourth of the coverage consisted of the opinions of Mitch McConnell,” the state's senior senator and Senate Republican leader, with news sources using his guest columns, or basing stories on his views of the health law. "To tackle the story from another perspective, Cross notes, a reporter might start with insurance agents," Lee writes. "Still, with an issue as complex and far-reaching as the ACA, it is essential to, in Cross’s words, 'take the time to learn about it.' That means knowing where to look for help and whom to ask." There are plenty of sources in which to do that, including Kaiser Health News, which has published several stories and conducted a series of webinars for journalists on how to cover the act. Plus, many states have health sites, such as Georgia Health News, Health News Florida, Reporting on Health (California), and Cross's Kentucky Health News, that provide stories that can be picked up for free. 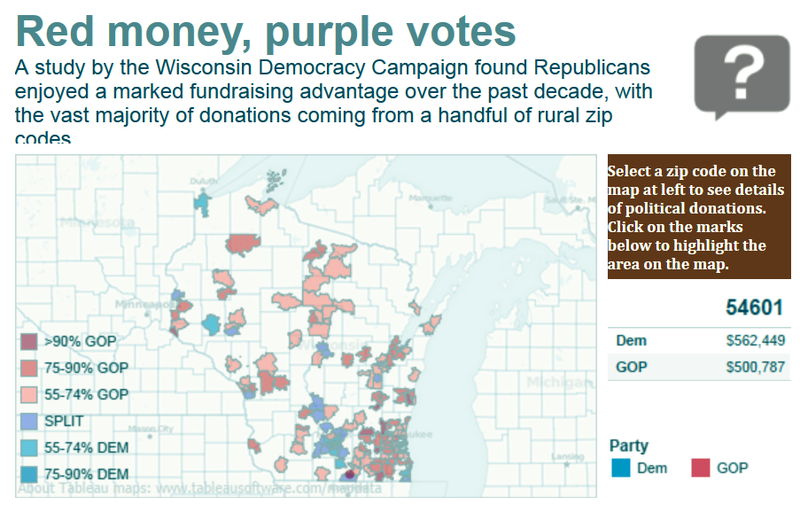 Here's a study that is easy to replicate in your state as log as it has a searchable database of political contributions: In Wisconsin, nearly 90 percent of the $94.4 million in contributions of $100 or more over the past 10 years have come from five urban and suburban areas, according to a report by the nonpartisan Wisconsin Democracy Campaign. The report stated: "The availability of both nurse practitioners and physician assistants practicing in urban areas of New Mexico is about twice that of rural areas." And with health reform kicking in, the state expects an estimated 160,000 new Medicaid recipients, and thousands of uninsured people will become insured, Heild writes. In November, five of 11 Republican-heavy rural counties that had secession on their ballots voted to secede. Also, Two Democratic state senators who backed state gun-control laws were defeated in recall elections, and another senator resigned before a recall election could be held. Elections for seats in a state legislature — especially House seats, which have smaller districts than Senate seats — are often essentially local elections, based in large measure on personal knowledge of the candidates. The more that state issues and outside money become involved, the more likely the election results are to follow state and national trends. In the last few years, a flood of national money has nationalized these local elections and created more single-party control of state legislatures and governments, The New York Times reports in the first of a series of articles on one-party states. Confessore acknowledges the influence of many other factors, but reports that "The strategic deployment of campaign cash has helped consultants and donors accelerate or arrest states’ natural drift toward one party or the other, defying national election trends or voter registration advantages." He quotes Republican strategist Ed Gillespie: “People who want to see policies enacted, and see things tried, are moving their activity to the states, and away from Washington. There is a sense that you can get things done.” That includes redistricting, which has probably allowed Republicans to ensure GOP control of the U.S. House through 2022. Almost every state has legislative elections this year. If your state has a legislature where a switch in party control is more that theoretically possible, the elections in your legislative districts could be targets for outside money, strategies and tactics. Confessore's article explains in detail how that works. Read the story.